Horse riding is no longer just an old sport that a limited number of people are interested in trying. This sport or hobby is gaining quite a bit of popularity and several women these days are eager to participate in it. However, having good horseback riding skills will not be enough since they also need to have the best horse riding boots for women for safety, style, and comfort. Hence, we have selected three horseback riding boots that are designed for women and reviewed them thoroughly. Below, we have discussed the features and pointed out the pros and cons of three pairs of boots. The brand Sam Edelman is known to offer luxury products at an affordable cost and these boots are no exception. The boots are a perfect combination of youthful design and a worldwide sensibility, yet its primary focus is the comfort on the feet. These boots are available in sizes ranging from six to ten and you can choose from two colors which are black and whiskey. They are entirely made out of leather and will last for a very long time as the material is imported. Likewise, the sole of each of the boot is constructed using a synthetic material for durability and excellent grip. In addition, this pair is very riding-inspired as noticeable by its asymmetric shaft as well as its single ear pull along with an embossed button. What is interesting about these boots is that they have an extensive opening, approximately 14 inches, which is enough for you to put your feet in conveniently. The heel, on the other hand, measures about 1.25 inches whereas the platform is estimated to have a measurement of half an inch. When it comes to the boot’s shaft height, it is about 15 inches from the arch. In addition, for it to be worn with exceptional comfort, a zipper on the back, which goes all the way down, has been integrated. There is also a snap tab to secure it tightly. The soles have high-level of grip. The product does not run true to size. The Saxon Women’s Equileather Zip Front Boots have a low-top design which means that they have an ankle length. The best part about this pair of boots is that, even though it is marketed for women, the design is also suitable for men. So, you can share it with your brother, boyfriend or husband, which makes it even better. Another cool feature is that the manufacturer has created a ton of adult sizes ranging from 5.5 to 11, as well sizes for children. The pair of Saxon Women’s Equileather Zip Front Boots is made out of an imported material which assures its durability as well as effortless cleaning. In fact, all you need to do is wipe it with a clean cloth after wearing it, or every time it becomes dirty. On the other hand, the soles are made from sturdy rubber that has a great grip. Likewise, the product has a completely built-in spur rest and gussets that are made from elastic which provide maximum comfort. A zipper on the back that is made from the very famous YKK brand is also incorporated. The pair is equipped with a quality zipper. The product has a great grip. The size of the boots runs smaller than the one indicated on the sizing chart. When it comes to high-fashion brands, almost everyone all over the world puts Tommy Hilfiger on top of that list. With that being said, the pair of Tommy Hilfiger Women’s Madelen Equestrian Boots keeps up to the brands high-quality and standards. This product has a size that ranges from six to 10, and it is available in three different designs and colors which are brown with grey flannel as well as black and brown with blue cloth. It is constructed using imported textile and synthetic materials with good quality. Also, a zip closure has been placed inside; a feature that sets the product apart from other boots. In addition, the company has a monogrammed logo at the top of the boots to add more style and uniqueness. Measurement-wise, the heels of the boots are 1.5 inches while the circumference of the shaft is approximately 15.25 inches and the height is about 15.2 inches. On the other hand, the mouth opening of the boots is quite large at 14.25 inches all around. Such numbers assure that the product will be comfortable even when worn for more extended periods. To add more, the toe of each of the boot has a round design to provide extraordinary comfort to the toes. The product comes from a well-reputed and high-fashion brand. The pair of boots has an inside zip closure. We can assure you that the boots we have reviewed in this article are three of the best horse riding boots for women on the market presently. They are all durable, stylish, and comfortable. Nonetheless, they are unique in their own ways. The pair of Sam Edelman Women’s Penny Equestrian Boots is great if you are looking for something that has an all-leather and chic design. Whereas, if you are into brands and you want a pair that is made using a combination of quality materials, then, the Tommy Hilfiger Women’s Madelen Equestrian Boots will be perfect for you. On the contrary, if you are not so into knee-length boots, the Saxon Women’s Equileather Zip Front Boots is an ideal choice. This pair is also great for those who are looking for one that can be worn by both males and females. Hence, it is the most practical choice amongst the three. However, you must take note that it is only available in two basic colors, black and brown, unlike the two models mentioned above. Thank you for writing this. I am lucky to have lots of horses near where I live (very rare in a big metropolitan city) and I often wondered how the riders could pick out a pair of boots that was both stylish AND good looking. Thank you for writing this. I was just wondering what are the advantages of the short boots v’s long boots? Is it a requirement for the type of riding that the person is doing or is it personal choice? Thanks for the positive feedback 🙂 For training it’s a personal choice but if you’re showing or doing competitions, then you’ll have to dress according to standard. You can take a look here to find out the different dress code standards for various horse events. Hi – are longer boots recommended over short ones? I’m thinking about chafing, but also safety. I’m curious as to whether they have steel toe-caps, and fur-lined options for the winter months. Do you know if these styles are matched with riding hats and gloves i.e. available as a set? 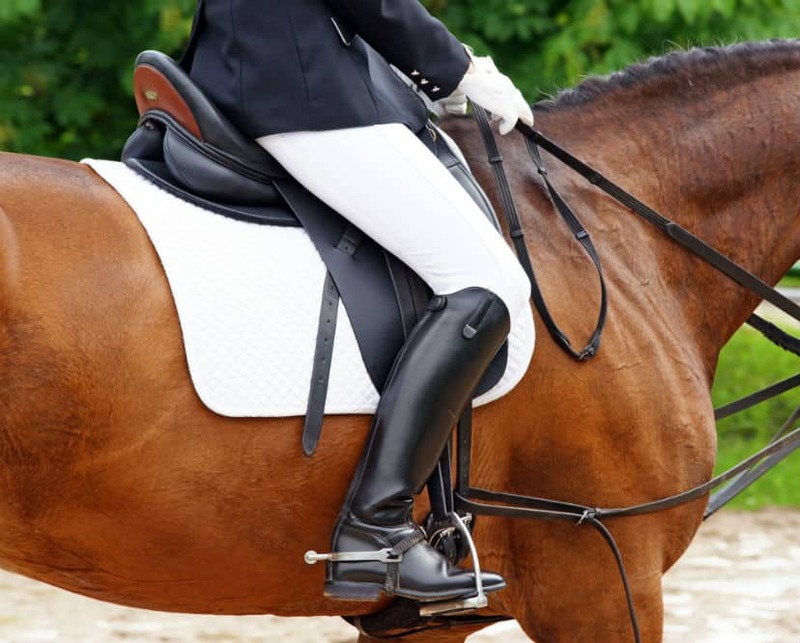 Not generally because you’re usually going to be wearing pants – mostly it can be helpful for grip if you have half-chaps. But, if you’re competing then there are regulations about style of dress that you need to follow. In terms of styles – I’ve written some posts about sets of clothing that you can put together. You can see them here and here. Also here’s a good overview of types of horseback riding apparel. Lastly, you seem to be in the book writing niche so I’m thinking you might like my list of best horse novels! I used to love horseback riding when I was a little girl. I love all of these styles but my favorite pair has to be the Tommy Hilfiger pair. I support Tommy Hilfiger because they do not promote sweatshops so I know that these boots were made in America by adult hands. I really like the different styles. Can you wear these casually other than horse riding? If you’re competing then you have to be more careful about what you’re wearing – like for instance show jumping and dressage have strict protocols about what you have to wear. Just for training or leisure, however, high boots vs. low boots comes down to your preference. For training I prefer paddock boots and half-chaps. Paddock boots, like you mentioned you wear all the time, are super comfy and versatile and then I can throw on half-chaps which I like because I feel like they give me a better grip, especially when I’m jumping. In terms of safety I don’t find there’s a difference so it really comes down to preference at the end of the day!